Hello, I'm Gregor and I put this site together. 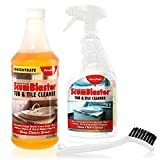 At first, you'll find an overview of recommended soap scum removers, followed by a public poll and a general buying guide on soap scum remover. 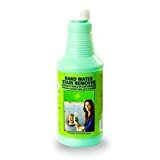 Further down on this page, we do link to other well-written articles and reviews about soap scum removers. At last, you'll be able to weight in your own opinion in the comments section. If you also want to vote on the best soap scum remover, click here to view the poll. Soap scum is a nasty mixture of soap, body oils, dead skin and bacteria that accumulates on showers and other bathroom fixtures. Removing this scum can be a daunting and challenging task. Ensuring that you purchase the right product to get the job done is essential to removing this scum with success. 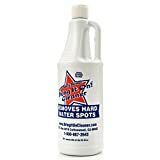 With so many different brands of soap scum removal products available, how can you be sure that you get your hands on the best product? In order to find what soap scum removal products works for you, you have to ask yourself what exactly are your needs? Some products work better for certain materials and other products work better for larger jobs. Once you narrow down what exactly your needs are, the process of finding the correct product becomes easier. Before we dive into how you can find the correct products, keep in mind that there is a difference in water stains and soap scum. 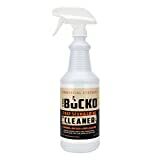 Soap scum can, with the right product, be cleaned. Water stains are typically a different issue and may require other products directed at that precise issue. What is your shower/bath made out of? Most people have a bathtub and shower made out of either acrylic, porcelain, fiberglass, and steel. However, there are some people who have higher end bathroom appliances. These are typically made with marble. It is important to remember that each of these surfaces have different requirements when it comes to cleaning. Knowing what your shower and tub are made out of is the first step in knowing which product to buy. Acrylic - Probably the most common material for a tub is acrylic. Acrylic is fairly easy to clean and offers a lot of different options when looking for the correct chemicals to scrub pesky soap scum. Most tub manufactures keep a list of the approved cleaners they recommend for their tubs. It is important to find an acrylic safe cleaner. By looking at the back of any commercial cleaning product, you can find if the cleaner is best to use on your tub. Natural products such as baking soda and vinegar are also safe to use on acrylic tubs. Porcelain - Cast iron tubs are a thing of older houses. These bathtubs are typically fused with porcelain enamel. These tubs are susceptible to cracks, chips and dulling of the finishing. It is important to find the right products to ensure that the old craftsmanship of these tubs never die. 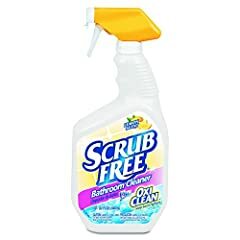 Finding a non-abrasive bleach free product to scrub your porcelain tub is essential to ensure that the finish is not ruined. Light products such as ammonia can aid in keeping your porcelain or cast iron tub in new condition. Natural remedies like those of baking soda also work as well. Fiberglass - Once again non-abrasive cleaners are going to be recommended with fiberglass showers and tubs. This is because abrasive products tend to scratch and ruin the fiberglass. Look for an acidic pH cleaner to help get rid of any mineral build-up. Fiberglass can also be an issue with accumulating mildew. If needed, look for a product that specifically mentions mildew. Steel - Most people do not have steel showers and tubs, however most of us have bathroom fixtures that are indeed made out of steel. It is important to remember to thoroughly clean shower, bath and sink fixtures when cleaning the bathroom. 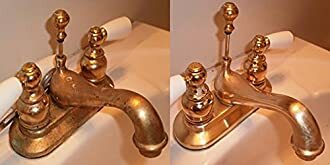 These fixtures, along side your tub, can accumulate the same amount of soap scum. So what works best on steel? Just about anything. Steel is a very resilient metal. Just about any cleaner out there can do the job. However, it is important to take a look at what exactly it is that is getting built up on your shower and sink fixtures. A common problem is lime build up. Looking at any products that say they remove lime buildup is probably your best best when looking to clean your steel fixtures. Marble - While the minority of people own marble bath and shower products, it is important to note that marble has it's own set of rules when cleaning. Marble is a gorgeous material, however it is also high maintenance material, and it requires special care. 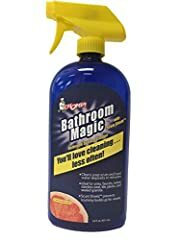 It tends to cost on the higher end of the spectrum and it would be tragic to ruin your investment by using the wrong cleaning product. Marble requires pH neutral products. Acids products, even natural remedies like lemon and vinegar, can damage the stone. Never use a rough material when scrubbing a marble tub. Even the rough side of a sponge can scratch this delicate stone. Microfiber towels are a perfect substitute to use when cleaning a marble shower. 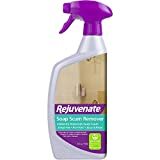 It is important to find a product that says it is specifically for marble showers or if you must, use something delicate such as dish soap for cleaning. There are a million different products available for a million different surfaces. It is always important to make sure you know what exactly you need to ensure that you do not cause damage to your bathroom fixtures. Individuals who purchase high-end materials like marble need to ensure they take extra care of their bathroom needs. 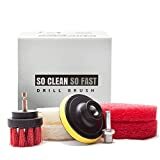 By buying higher-end products to clean their tub, especially those that need specific an delicate cleaning products, they can ensure that their showers and tubs stay in pristine conditions. If you are unsure about which products are the best fit for your tub, speak to a professional at the store you are purchasing from or speak to someone who works in the cleaning industry. It is never a bad idea to seek a professional opinion. New: Our editorial list of additional articles. 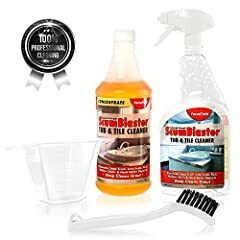 We decided to gather informartion all around the internet and present you a list of helpful, external links to interesting reads about the best soap scum removers and their reviews and guides. 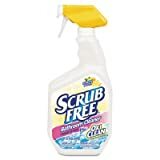 You're not convinced by the previous writings about soap scum removers? Of course you can just choose by visual impression, that's why we present you all our chosen products at a single glance. A click on any image is enough to open an external link to the best offer we could find. Finally, we want to present you our rating criteria for our soap scum remover comparison, so you can better understand and comprehend our recommendations and the rating process itself. 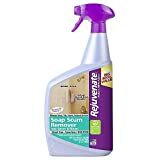 Furthermore, we still ask you to keep your eyes open for short term deals in order to make some great bargains with soap scum remover in 2019. Published by G. Krambs on StrawPoll.com (last update on 2019-04-19 08:13:54). 21 of 26 readers found this article helpful.